Retailers are looking for efficient engagement with customers at multiple retail touch points, which helps them attract new customers and also retain the existing relationships. Converting customer visits into revenue is a major challenge that retailers face in this age of increasing customer expectations and tight competition. In many instances, retailers face issues like- the Omnichannel customers in search of the right products might push off without making a purchase. Imagine if retailers can provide the most authentic product information and can entice them by sharing personalized offers or coupons at the moment. This will elevate the overall customer experience and also save the sale. The next generation disruptive technologies including Virtual Reality, Augmented Reality, Artificial Intelligence, and Machine learning can play a key role in augmenting the digital retail experience. Virtual Stores, an amalgamation of these technologies brings the store to the shoppers where the shopper can select the store he/she wants to visit, make an appointment for trial & pick and can even book a cab after making the purchase. V-Store is a perfect fit solution for Retail industry players who are looking to engage with the customer at an early stage, where customers can leverage the Omni channel substantially either to do pre-purchase research or to make a purchase. Some of the key application areas for V-Store in retail include- Health & Beauty, Toys, Jewelry/ Watches, Sports Equipment /Outdoor, Furniture & Homeware, Clothing and Footwear, Household Appliance, Consumer Electronics and Computing systems. Retailers are experiencing multi-dimensional competitions. While new retailers continue to disrupt the status quo, globally approximately 28% of customers say that they shop less often at retail stores because of the e commerce retail store options; in the U.S. that figure was 37%. It is becoming crucial for retailers to engage with customers through Omnichannel strategies. For better customer engagement, many branded product manufacturers are attempting to build their distribution networks to traverse ‘the last mile’ connectivity. Apart from this, retailers are under significant pressure to make smarter investments to differentiate their offerings under sluggish consumer demand that might continue for long. 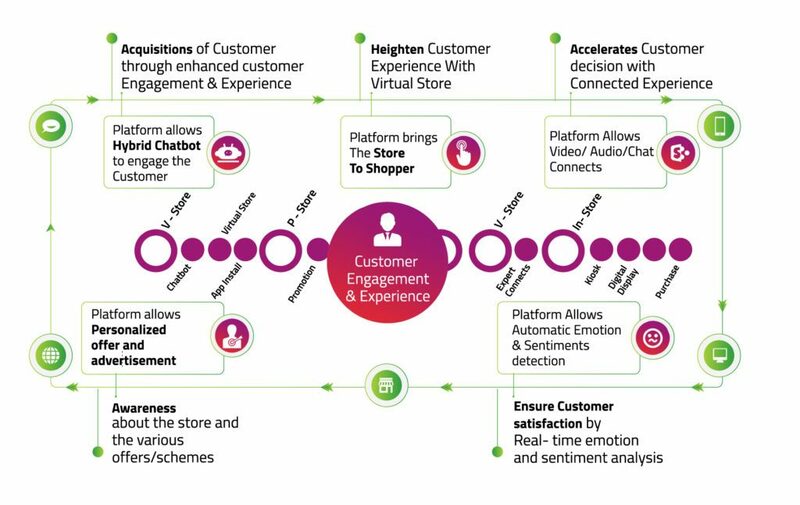 V-Store brings a unique experience from engagement-to-checkout; with the right mix of Cognitive Self-Learning Engagement-bot, the Virtual Experience Store topped up with Experts Connect, Emotion/Sentiment tracking and Intelligent Next Best Action. V-Store enables retailers to expand their foot prints without worrying about the physical infrastructure or the real estate. It enriches the shopping experience, engages the customers, and also increases the sales conversions while minimizing the number of unhappy shoppers. V-Store solutions from Happiest Minds enable retailers to digitally extend/ set up their store layouts virtually so that they can improve the customer experience and increase the sales without investing for the physical building. Purchase and choose the option to get delivery at the doorstep or make an appointment to visit the store physically. Option for shoppers to make a purchase and choose to get doorstep delivery or scheduling appointment for store visits to make a Trial and Pick Up. The world is digitally increasing day by day, and this is driving organizations to digitize business processes and models.. Intelligent machines that can see, perceive, read, think and speak like humans are not anymore a concept..